Thirteen-year-old wannabe crimebuster Samantha Brown innocently helps a stranger enter a house while out on her paper round, only later to discover that he burgled the property. Now that she’s an accomplice to a crime, everything starts to go wrong around her. 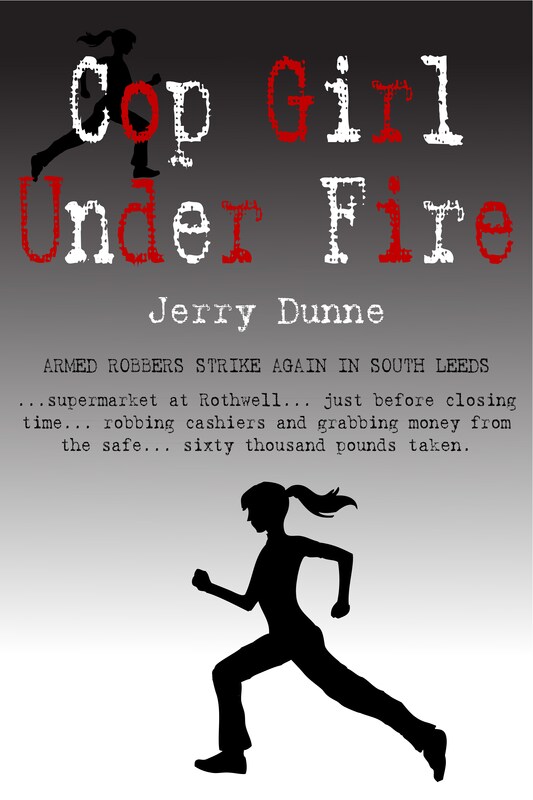 Her neighbours suspect her and her dad for the burglary, her mum’s workplace is robbed by an armed gang, nasty graffiti is scrawled across her house, and she soon suspects someone sinister is shadowing her dad. What will this wannabe cop girl do about it all? Her decisions lead to startling and terrifying consequences. I’m Samantha Brown, but everyone calls me Sam. I’d been wanting to do a paper round for ages where I live, which is in Beeston, South Leeds, and after recently turning thirteen, it meant I could get one at last. I usually enjoyed it a lot, but not on this particular day. On this day things went from bad to really bad. … Morrisons supermarket at Rothwell… just before closing time… robbing cashiers and grabbing money from the safe… sixty thousand pounds taken. I sucked in my breath and held it for a good ten seconds before releasing it slowly through gritted teeth. … well organized and well armed gang. A man tried to stop one, but was knocked to the ground. The police believe this gang has already robbed two supermarkets and two bookmakers in South Leeds. So far they have got away with amounts of up to one hundred and eighty thousand pounds. This was the fifth time they’d got away with it. Why hadn’t the police caught them yet? The gang is believed to have five members in all, an extra man being used on the three supermarket jobs, all of them Morrisons, one in Morley, one in Hunslet and now Rothwell. The gang is known to swap jokes with people while carrying out the raids. They behaved worse with each robbery. Hopefully that would be their downfall. One day they’d stretch their luck too far and then… bam! The police would be all over them like flies over muck. Every other house on my round had a circular yellow Neighbourhood Watch sticker in their window, yet some still got burgled. Today, I discovered three separate lots of shattered glass by the kerb. This meant three cars had had their windows smashed in, though the cars were gone now. Since yesterday, someone had scrawled fresh graffiti on the electrical box on the street corner. Along with the armed robberies, all this stuff made it feel like, “We were sinking in a sea of crime,” as Mr. Fallon, our Neighbourhood Watch leader reminded us. My hands balled into fists. I wanted to be a policewoman one day and if I’d been older and in uniform just then, I’d have set about hunting down these clowns right away. My round included the Fallons, a corner house in the street next to ours. Approaching from the side, I saw a black pair of trousers and a white shirt with a security company logo on the shoulders hanging on the garden clothesline. Above the back door, a CCTV camera looked down on the garden. An alarm box was fitted to the side of the house. Around front, I triggered the security light just by standing outside the gate. Look straight at the powerful light and you got blinded. I imagined a siren going off whenever I moved up their path and a loud voice screaming out, “Halt or we’ll open fire!” Three Neighbourhood Watch stickers were on display inside their windows. Out came my little can of bicycle oil, and I squirted some on the gate’s hinges. I eased the gate back and forth and when no squeak jumped off the hinges, I wriggled it hard. Quiet as butter spreading on bread. If the CCTC camera, burglar alarm, heavy door locks and window stickers failed to stop any burglars then Bouncer would surely do it. Except that Bouncer didn’t seem to know the difference between a paper round girl and a burglar. I tiptoed to the front door, and silent as a shadow pushed the paper in through the letterbox. The wind howled, blowing across the house, rattling a few loose objects. I retraced my steps to the gate, and once outside slammed it hard. Bouncer came charging round the side of the house. His paws pounded off the earth before slithering to a stop at the gate. This big mongrel mutt with his black shaggy coat and small cunning eyes stuck a huge, pink panting tongue through the bars of the gate. “You’re too late, Bouncer lad.” I tweaked his wet black nose. “You know you got to be sharper than that to catch Sam Brown.” I wiped my wet fingers on my trousers. When I turned round, Kylie Cotton was standing there, frowning at me. Bouncer growled low, fixing his stare on Kylie. She jumped right away from the gate. To make a good impression when trying to join the police, it’s a good thing to already think like a policewoman. The earlier in your life you start to do this the better, in my opinion. Well, my paper round presented an ideal opportunity to do just that – by keeping an eye out for mischief. So it wasn’t only a paper round for me, but also my beat. I dropped papers in three doors in Redhall Crescent and then went on to Redhall Gardens. In this street was a house I had under suspicion. It had split wooden window frames with dirty windows and an old wooden door. The garden path had cracked flagstones with weeds crawling from every crack. The garden hedge grew jungle wild. You got the impression the only type of bird that might settle on the roof was a crow. The wind swept through the street and the house groaned in protest. A notebook is an important tool on my beat. I flicked through the pages until I found my notes on this house. I’d never seen anyone come or go since I’d started observing it. Yet in my notes I had curtains fully open downstairs every day last week, and now they were half open. Upstairs, they’d been closed all last week, but now were fully open. What went on behind those curtains? I’d also noted the black bin’s position, which last week had been under the living room window. Today, it stood just off the garden path. Was someone up to something dodgy inside the house? Was it drug dealers? Or some other horrible type? Once I’d added a few new notes, I moved on. After delivering one more paper in Redhall Gardens, I began retracing my steps when I stopped dead opposite that house. A man was trying to prise open the living room window. First he squatted low facing it, pushing upward this way, and I heard him grunt. Next he turned round with his back to it, and I dived behind a garden hedge. Then he put his back against the window and got his arms on the underside where it was already open a bit. His mouth twisted and his brow puckered as he tried to raise it. He quickly gave up and stood facing it, scratching his head. He wore a dark suit with a white shirt and paisley tie, not quite a burglar’s dress code, and all this time his eyes had not shifted about uneasily to check if anyone was watching him. Now he stuck his hand in his trouser pocket, and pulled the white lining all the way out, staring at it and shaking his head. I nodded my own head in understanding, figuring he’d only gone and lost his key. Clean shaven, with short fair hair, his big boyish grin stretched his mouth very wide. His ears stuck out. He raised his eyebrows. “Aye, it might,” he said. After I’d done it, he got one side and I got the other, and we both strained our muscles for a bit. The window didn’t budge an inch. I stepped back, breathless, studying it. His eyes shone bright at my idea. We shook it and then put our backs into raising it again. My muscles quickly burned, but this time the window rose a little. It rose some more. I took my hands away and he moved it up by himself. He tried again to make me take the fiver. I did so, but only after a show of shaking my head first. It went deep into my pocket. At last he climbed inside his living room window, leaving it open behind him. I went out the gate with a spring in my step, dreaming about the uniform I’d be wearing when I joined the force. Next moment, though, I had to think about how appearances can be deceptive. I had thought only criminals lived in the house, yet this man had recently moved in. I delivered some more papers then climbed the hill before discovering I had a paper left in my sack. Where had I missed? I slapped my forehead. Helping that man get into his house had distracted me and I’d forgotten to deliver my last one. Back in Redhall Gardens, eight people had gathered outside the man’s house, four old ones, and four younger ones, and one dog. All were gazing at his house, chatting away excitedly to one another. I forced myself to put one foot in front of the other toward the door where I had to deliver this last paper. A prickly sensation was spreading from my stomach into my chest. I took my eyes off the crowd long enough to shove the paper through the letterbox. Crossing over, I halted on the kerb. A gap appeared in the crowd, giving me a view of the garden. A uniformed policeman and a plainclothes policewoman stood inside the gate talking to an old man. The window remained wide open. My mouth opened just like it. People turned to look at her. A boy about my age turned to look at me and I skipped to my right, hiding behind others out of his line of vision. “What did you see?” asked the uniformed officer. The grey-haired woman shook her head. I took off my jacket slowly. My hands really shook as I struggled to fold it small and stick it inside the sack. Then I undid my ponytail and pulled my hair loose. Just in time, too. The boy who’d turned toward me only moments ago now stepped to the side and stared hard at me. I glanced away, feeling a blush coming over my cheeks. But then I stared back at him just as hard. Now it was his turn to look away quickly. I walked away from the crowd, counting every step, and praying I’d reach a hundred without anything happening. I could still hear their talking even after I’d reached the corner of the road. Suddenly, their voices got louder and I imagined someone had just pointed their finger at me. I spun round, ready to plead for mercy, but no one shouted, “Stop, thief!” and not a single face looked my way. At the top of the hill, I paused opposite the Whistlestop Pub. What had just happened? What had I done? Where was Gavin? He should have finished his own round by now. I kept glancing down the hill while pacing back and forth like a nervous fox trying to work out the best escape route from the hunt. A passing police car looking for anyone fitting my description would pull me over in a moment if they saw me running, so I wouldn’t do it. The wind blew along the empty road of Cross Flatts Place, and I heard a scratching sound behind me. I picked up my step. I daren’t look back; I prayed a hand wouldn’t fall on my shoulder. At the corner, a heavy silence fell over the street. The scratching sound, following right behind me, caused my eyes to flit from right to left while hairs bristled at the back of my neck. A flicker of movement came from my left, and my heart and I both jumped round. Passing my feet, pushed on by the wind, was a… a… oh! a crisp packet making a faint scraping noise. The breath slowly hissed out of me and to my horror kept on hissing as I seemed to deflate like an old tyre. If people could die from embarrassment, I’d have died in that moment. Outside my front door, my trembling fingers dropped the key twice before I was able to squeeze it into the lock. Once inside, I banged the door shut and pressed my back up against it. My mobile started ringing on the hall table where I’d left it. I lunged forward. “Have you gone mad, Sam?” Gavin’s voice asked. “They robbed Morrisons at Rothwell,” I announced. I fell onto a chair and gulped down a glass of orange juice. Mam put a plate of fish fingers, mashed potatoes and peas on the table. I used my fork to cut up a fish finger before sticking a piece on my tongue and chewing the edge of it. My little brother Danny was shovelling food into his mouth. My dad had a newspaper on the table beside him turned to the back pages. He never took his eyes off it even though a huge amount of food was speeding off his plate and into his mouth. Mam was finishing a sandwich. She glanced at her watch, and began pushing books into a bag. I read off the titles: Critical Care Nursing, Common Foundation Studies in Nursing and Bailliere’s Nursing Dictionary. “Make sure you do your homework,” she reminded me. “The staff must have been terrified out of their wits,” I said. “Two till workers from the Hunslet robbery are still upset. Stop eating so fast!” she snapped at Danny. “I’m hungry,” he mumbled, his mouth full with bits of fish finger dropping out. “He’ll be all right,” Dad said, without a glance up from the newspaper. “I always do my homework,” I said, just swallowing the first piece of fish finger. She put her empty teacup in the sink. Dad’s eyes dropped back to his beloved sports section. With her bag on her shoulder, Mam kissed us all on the head. Moments later, we heard the front door open and close. “Can I’ve some more fish fingers, Dad?” Danny asked. I’d only eaten one piece of fish finger. My food had gone cold. “Take it!” I pushed the plate across. I wrinkled up my nose and shook my head. How could I feel hungry? I’d just helped a man rob a house. That would kill any appetite. How had I got it so wrong? What was I to do? Turn myself in? Or wait to see if I’d get caught? What about my future in the police? You can’t join the police if you’ve got a criminal record. On the other hand, how dishonest not to turn myself in once I’d found out I’d helped in a burglary. My breath came out in a rush. The more I thought about it, the worse it seemed. I stared at my little brother spooning mashed potato into his big mouth. Oh, if only I were nine again. There’d been no worries back then. It’s only as you get older you have all these worries and problems. No one noticed me rip out the pages from my notebook about that house and then rip the page itself into tiny pieces and throw them in the bin. I glanced over my shoulder just to make sure no one saw me do the same with the fiver. Blood money! “What about some ice cream?” Dad asked, picking up a pea on the flat side of his knife and popping it into his mouth. I ran out to the garage where we had our deep freezer, and filled two bowls. Appearances can be deceptive. These words echoed around in my mind, mocking me. Motorists! The two bowls of ice cream almost slipped from my hands. The word made the burglar’s face spring into my mind’s eye, and I wondered if maybe I’d seen him somewhere before. But where? And if so, why hadn’t I recognized him straightaway?